My once-upon-a-time colleague Harvey Araton wrote a piece in the New York Times last week in which he mused . . .
[Alex] Rodriguez is fairly new to Twitter but, like Cashman, has long been a friend to old media in the muckraking tradition of George Steinbrenner. Somewhere, the pinstriped spirits of the Boss and Billy Martin must have had a good laugh this week, raised a glass to old times and wished they had had such immediate digital access to the masses…. And oh did that bring back some memories. The best of times, the worst of times. One of the most exhilarating nights of my career, and the horribleawfulterrible day that followed. It’s a tale of triumph and anxiety, an untold story of baseball’s notorious Bronx Zoo, and a terrifying meeting with a boss against whom The Boss himself paled in comparison. Pull up a chair, kids, and I’ll tell you a story. It’s a long one. Grab a beer. It’s July of 1978, and I’m the night sports editor at The New York Post, a dream job if I ever would have one. I’m all of 27 years old — TWENTY-SEVEN YEARS OLD!!! — and I’ve been entrusted to design and lay out and manage a team of editors in producing the newspaper’s celebrated sports section. Yeah, I love. This. Job. The Yankees are the talk of the town, and Reggie Jackson, the straw that stirs the drink, is coming off a five-game suspension for bunting despite knowing full well that the dugout had taken back the bunt sign and he was to swing away in the 10th inning of an 11-inning loss. His refusal to follow orders has infuriated Billy Martin, the manager, who has succeeded in getting Reggie suspended. And George Steinbrenner, the owner, is blowing his top roughly every five minutes. The Yankees own the back page of New York’s warring tabloids, The Post and the Daily News. They own the sports section of the New York Times, as well. Newsday, too, not that you can find one in the city. It’s a hot summer, and Billy, George and Reggie are fanning the flames. You can’t send the paper to press without checking first to find out whether Billy has sneezed, Reggie has coughed or George has passed gas. So it’s around one in the morning when I get a call from The Post’s Yankees beat writer, Henry Hecht, who is at O’Hare Airport waiting to fly from Chicago to Kansas City. Clear out the back page, Henry tells me. 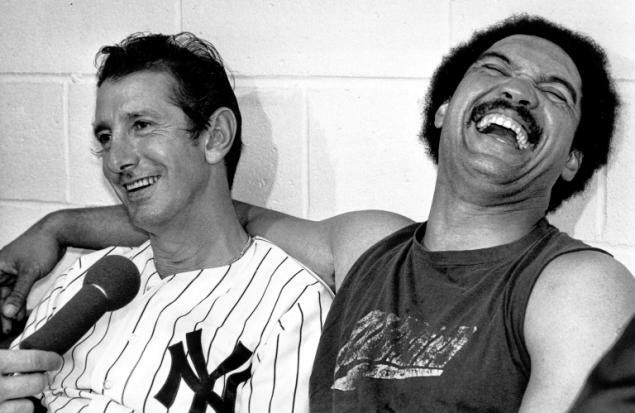 The Yanks are going to fire Billy Martin. Can’t tell you now, I have to catch a plane. Yeah, I love a mystery. A couple of hours later, Henry is in Kansas City and he calls me again. Billy had a few drinks too many at the airport, he tells me — well, that’s hardly news — and he has said of Reggie and George . . .
Now, this is just not the sort of thing you’re supposed to say. Not about a future Hall of Famer who happens to be your star player, and not about the guy who pays you to manage his team — a guy who just so happens to have been CONVICTED a few years ago of illegal contributions to Richard Nixon’s presidential campaign. Henry tells me he’s already spoken with Steinbrenner, and Steinbrenner has told him Billy is toast. Stick a fork in him. Bye Bye Billy. But there’s a slight problem. Henry and the Times’ beat reporter (I believe it was Murray Chass) were both with Billy when he said it, and they have agreed on the exact quote. But the Daily News’ reporter (I think it was Phil Pepe) was very inconveniently visiting the men’s room when it happened. And Billy is already telling Pepe he didn’t say it, which means that in the grand New York tabloid tradition, The Post is now saying that Billy said “One’s a born liar, the other’s convicted,” and The News is saying nope, never happened, nothing to see here. But Henry says it happened, and the Times is in agreement, and George has told Henry he’ll be firing Billy in the morning, and that’s good enough for me. But this is bigger than back page. This is front-page stuff at The New York Post. So now it’s around 4 in the morning and I get out of my chair and walk over to the paper’s managing editor on duty, an affable fellow named Phil Bunton, to tell him what we’ve got. And he gets up and walks me over to the executive editor’s office, in which I’m expecting to find a red-faced man named Ted Bolwell, a bombastic man from Australia or England or somewhere where they don’t speak English, don’t understand baseball, and who in his short tenure has struck fear in a New York tabloid newsroom. Did I mention that I’m 27? Yeah, that guy. Maybe you’ve seen his face before. 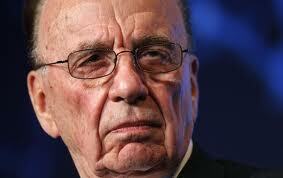 Rupert Murdoch is the new owner of The Post and I am well aware that he has a reputation for eating editors for dinner. They go well with a nice Chianti. And that thing I said about Australians not speaking English . . . I was just kidding. Did I mention that I’m 27? Do you trust your reporter? And I tell him I do, because yeah, I do, and he waves me out of Ted Bolwell’s office and I go back to putting out a sports section. And what’s more, we’re the only ones with the story. The Times won’t hit the streets for a few more hours and The News is saying it didn’t happen. Which means I am KING OF THE WORLD! And I’m only 27. And I grab several copies of the paper on my way out the door, and I get into my car and start driving home. And it isn’t until I’m nearing the end of the Harlem River Drive, on the ramp approaching the George Washington Bridge, when it hits me . . . BUT I DON’T TRUST MY REPORTER’S SOURCE! Which means George Steinbrenner can wake up in the morning, change his mind and deny everything the source close to George Steinbrenner has told The New York Post. And that’s when I break out into a cold sweat. Because George may be The Boss, but MY boss is bigger than The Boss — and he will be very unhappy if The New York Post’s wood turns out to be wrong. I arrive home and tell my wife the whole story, and explain that we could be moving back to my parents’ house if Billy doesn’t get fired. Today. And then I go to sleep. Or try to. I wake up in a panic every hour or so and walk out of the bedroom to ask my wife if Billy is still wearing pinstripes. 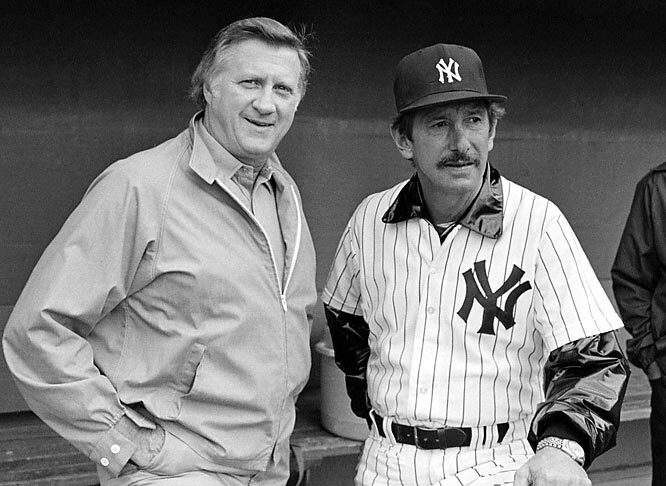 Finally, in mid-afternoon, my wife opens the bedroom door and announces that the Yankees have just fired Billy Martin. I’ve never been so happy to see a man lose his job. This entry was posted in Baseball, Journalism, Sports and tagged Billy Martin, George Steinbrenner, New York Post, New York Yankees, One's a born liar, Reggie Jackson, Rupert Murdoch by stephenbromberg. Bookmark the permalink. LOL..great story. And how old were you?